I am very excited. I asked a couple weeks ago for all y'all to send me pictures of your Corning Ware collections and Max, in Arizona, has the honor of being the first "My Collection" Monday post. From left to right... 3 cup Teapot (P-103), P-57 Deluxe 2 quart Tea Kettle, 6 cup Teapot (P-104), in the back looks like a P-119 Range Top Percolator (9 cup) and in front of that, a P-116 Range Top Percolator (6 cup) then a beautiful 8 cup Teapot (P-105) with the Drip Coffee Globe (P-118-U) which when originally sold with the accompanying teapot, it was re-numbered as P-118-B instead of P-105. (a little information tidbit). On the end is the 6 cup Range Top percolator (P-166). Last, but certainly not least, 2 awesome Cornflower Blue Coffee Mugs made of Suprema Ceramic Glass. Suprema, while still a ceramic glass, is made of a slightly different formulation than the original Corning Ware formula or the Centura formula. These were released as part of the 35th anniversary celebration of the Cornflower in 1993 along with the "Cornflower" Corelle pattern (made of Vitrelle laminated glass). An AMAZING Collection, I must say. Thank you for sharing, Max. Want to show off your hard earned collection on Corningware411? 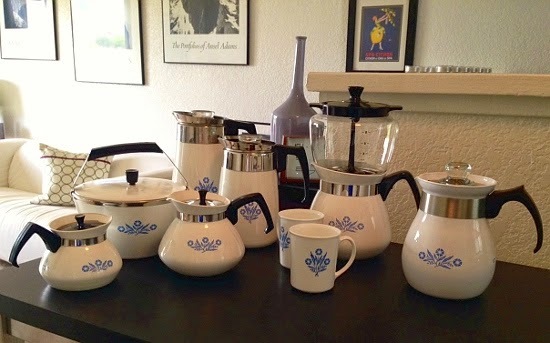 Send your photo to corningware411@gmail.com and I will gladly post them on the next "My Collection" Monday. So hey everybody, where is YOUR Corning Ware?? What a collection! I did not realize there were so many pots. Shane, thanks for posting my collection! I am honored that it could be part of your awesome blog. I enjoy trying some of your recipes, keep up the good work!